Save time at registration by printing, completing and bringing the entry form with you to the start. Comeragh Crossing, Comeragh Challenge, Nire Valley Walk and Kilbrien Walk All starting and finishing at Bridgie Terries Bar and Restaurant, Killineen, 5km east of Dungarvan. Map reference X 301/970 All four walks take participants to the top of Cruachán with its beautiful views of Dungarvan and the bay. The area of the walks is on O.S. sheets 75 and 82. By participating, you are making a contribution to the West Waterford Hospice. Walking boots are mandatory for all walks. WALK 1. The Comeragh Crossing. Clonmel suburbs to Bridgie Terries. Bus leaves at 07.30 hrs. This walk is 35km and takes 8-10 hrs to complete via Long Hill, Punch Bowl and Knockanaffrin slopes to the Nire Valley, then Coumfea, Seefin, Treenearla Commons, Mauma Rd. and Cruachán, mainly on mountain terrain with 1,250m ascent (approx.). Club marshals and sweepers will be on the route. WALK 2. The Comeragh Challenge. Clonmel suburbs to Bridgie Terries: Bus leaves at 07.00 hrs. This self-navigated walk is further (45Km), has an ascent of 2,000m (approx.) and is aimed at the very experienced and fit walker with navigation skills. It takes walkers via Lachtnafrankee and Knockanaffrin Ridge to The Nire Valley; then via The Gap, Carrignagour, Boola Cairn to Coumfea, Seefin, Farbreaga and Cruachán. WALK 3. The Nire Valley Walk. Nire valley car park to Bridgie Terries. Bus leaves at 10.00 hrs. This walk is 22Km’s and has 900m ascent (approx.) and takes 5-6 hours to complete. Club marshals and sweepers will be on the route. WALK 4: The Kilbrien Walk. Kilbrien to Bridgie Terries. This walk is 10km and has 350m ascent (approx.) and takes 3 hours to complete. Club marshals and sweepers will be on the route. Registration from 06:30hrs at Bridgie Terries. Entry Fee is €25 for Walks 1, 2 and 3, and €20 for walk 4 Please allow 30mins to register before bus departure. This covers bus transport, refreshments at The Nire Valley and Mauma Road, a hot plate on completion and a contribution to West Waterford Hospice. This walking event is the first to go green. Leaving no trace. Taking your litter Home. Reducing CO2 emissions. Reusing signs. Recycling waste. FROM THE MOUNTAINS TO THE SEA LET’S KEEP WATERFORD LITTER FREE. Bring your own food and drink to enjoy a summer BBQ in Marie's garden, Abbeyside. Tickets are limited and cost €5. Contact a committee member to get your name on the list. Come and enjoy a round whatever your experience. Friday 12th June at 19:00. €5 for club & ball hire. See you on the Tee. April proved to be a very busy time in the Club with walks taking place in many different areas. On Saturday 11th during the Dungarvan Food Festival, Peter led a large group on a walk in the Knockmealdown Mountains. The regular Sunday B & C Walks on the 12th and 19th went to the various popular spots of the Comeraghs, Mount Mellary and, Mount Stewart. The Thursday B& C Style walks also went ahead and as always enjoyed a hot cuppa and a cake at the end. The main event of the month was the Club's annual April Weekend away. This year, the beautiful Kerry town of Killarney was the chosen venue and by all accounts was a huge success. On the 9th May a walk for Pieta House will take place, starting at 04.15 from thSt. Augustines Secondary School. If anyone would like to be a steward on the day, please contact Ted. A Dublin walking group are staying in Rathgormack on the weekend of 23rd / 24th May and contacted us for some joint walks and local knowledge.Details on walk sheet. Please try and join us. The Annual Comeragh Crossing will take place on the 4th July. Any club members who would like to help on the day, please contact one of the committee. We can all do our bit to make this event the success it has always been. We are looking for check point marshals and stewards. Supporting the Dungarvan Lions Club the Annual Cunnigar Crossing will take place on August 2nd. The departure time will be announced nearer the date as it all depends on those tides!!. After the walk, we will repair to Tig an Ceoil Pub for refreshments and collection for the Lions Club. Remember to bring along a change of foot wear as it can get very mucky. The Annual Holiday Abroad in September this year is to Tenerife. This was the destination of the very first club holiday abroad. As it's the 20th Anniversary of the Club, it was decided to pay a return visit. Some great walking is planned so get your name down, get in touch with a committee member for more details. 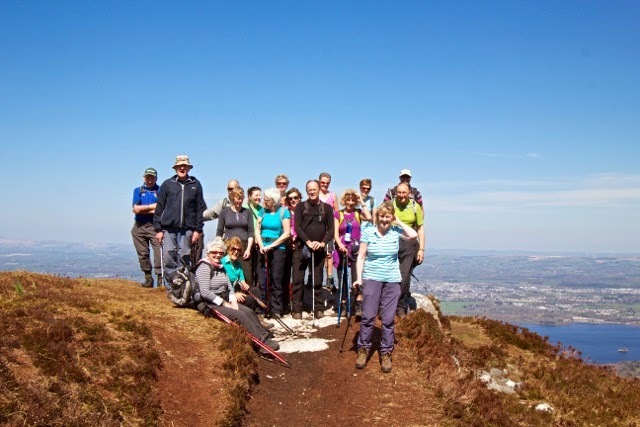 Dungarvan Hill Walking Club really is about FITNESS, FRIENDSHIP and most of all FUN. So why not read more about us on www.dungarvanhillwalking.org for more info. PLEASE REMEMBER. NO BOOTS. NO WALK.